Today are the presentations and I will be posting key tips and items that I found interesting throughout the day as well as my own feedback. Jonny’s presentation has a title for each module and looked at specific artists that relate to his work. Looking at them allows him to pick out what he wants in his work for example Liam O’ Farrell and Jill Gibbon. I think it is clever how he has used different media to show case his work for example a pack of cards and posters. Its based on a topic (transgender) that is rich and complex yet can be hard to show and tackle as it could be classed as dirty or seedy which people can turn away from. Within my book I could have interactive items similar to The Jolly Postman by Janet and Allen Ahlberg where they had items in flaps and cases that helped to read the story. Paul’s presentation is about what the key issues are with the western society that concerns him – media bias, war, murder, organised religion, the removal of any “real” decent. The audience he wants to direct to is unlimited as he doesn’t know who will like it. Mainly it’s for himself but he would create a motion book which would be available through Madfire. He claims that the market research can be manipulated to gain the acquired results. He showed us a motion book which looks amazing, an image that has a movable 3 dimensional quality and panoramic viewing as well as sound with the graphic images. 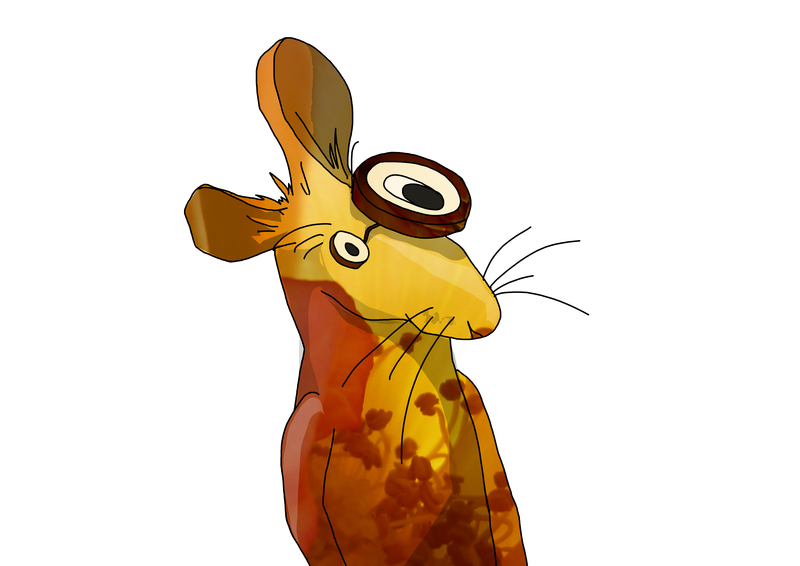 He is looking at key artists such as Sergey Kolesov and Frank Miller. He will be creating a 48 page interactive comic book for next term, for now he is just researching into his style and concepts. Joe, is looking into design for the music industry. Does image design affect the way you buy music, to persuade and influence. Also why has buying physical copies reduced in sales and buying online has increased? Is this affected by graphic design? Looking at if graphic design has changed artists album work as well as how the wholes design of a package can persuade people’s purchases. He has looked at Linkin Park, looking at their album artwork from 2000-2014 showing they have cleaned their look from grungy to clean and precise. Some of the design he had shown were pleasing and was similar to owing a book in the sense of it could be displayed on a shelf. On the physical side he wants to look into how the CD packaging can be more aesthetically pleasing, to create more than just a CD case that holds the CD and then to create test designs. He was challenged to look at audiences that are more challenging and their identity – so people who has bought the CD but would throw it away rather than keep it. Similar to my work in the sense of my book has to be aesthetically pleasing to attract the reader. I could consider when designing my book whether it is going to be a traditional solid book or have parts cut out making it more interactive. Methodology a means to find something out – testing things out to see what happens. Rather than I am going to create a character then a storyboard then etc. Leah is a graphic designer and she has been looking back on her work. Looking at ephemera- things that exist or are used or enjoyed for only a short time. A greek word Ephemeros meaning ‘lasting one day’. Permanency that are constantly around. She has focused on ephemera such as parking tickets and then looking/experimenting with paper cutting and laser cutting. Artists being Wilhelm Staehle and Kyoko Imazu. It was an interesting presentation as I had never heard of this and I even had to google what it meant during the session. Amy’s presentation focuses on dyspraxia and how to make it more engaging to learn. Looking at logos to show how a symbol can be instantly recognised. To make it easier to find and learn about the condition through the website, she needs to find out who is looking at and how they are accessing the website. April’s presentation is based on branding problems, not deep enough to understand, no brand promise just a logo or a name etc. Her dissertation covers branding as well as designing etc. Focusing particularly on ‘The Sensory Experience’ examples being Starbucks and Volvo. Volvo understanding the 3 senses when driving, sight, sound and touch realising this they spread the message of Volvo being the 6th sense creating security and safety. Synesthesia – Saying the word tomato, doesn’t mean you necessarily have to have a tomato in your mouth to see it in your head and to sense it in your mouth. She’s creating her project around food as she finds it interesting and she created a major project at college based on the food industry. Now focusing on specifically supermarkets, interestingly she commented on how they are cold and not customer friendly in the sense you walk in and then walk out forgotten. Ideas to make it more friendly would be to have a farm where the customers could go and visit as well as create brands or logos that gives an extra edge to the customers. Her final outcome being factious brand for an ethical supermarket. 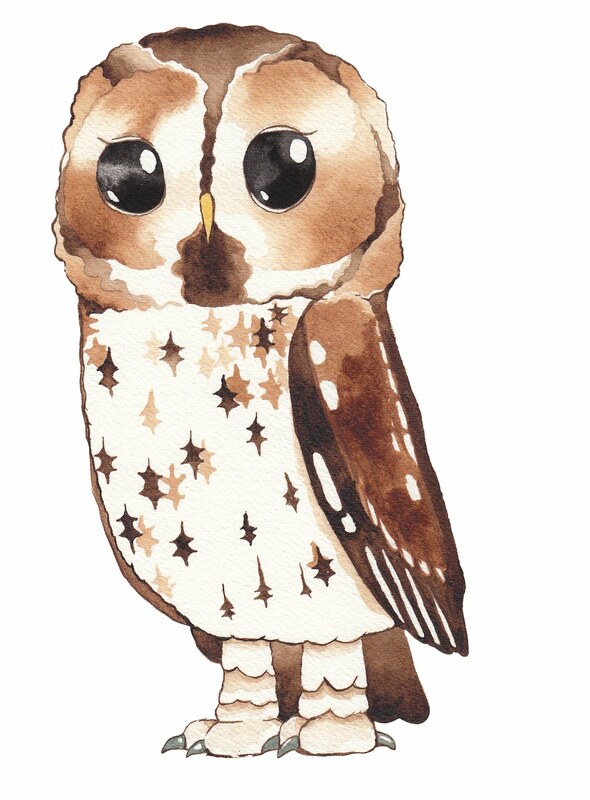 Grace is raising awareness of the RSPB Red List through the use of pattern, there are 52 species on the red list caused by non breeding decline. Pattern is fashionable and is used for a variety of things. She was going to create a more appealing bird guide but after research she was going to focus on a smaller group of birds to target her audience. Birds are used on wallpaper, furnishing and various materials for fashion. She wouldn’t specifically do furnishing but general products, looking at artists Matt Sewell who uses cute animals to create an empathy with the character. She has looked at artists who create complicated designs as well as simple designs. 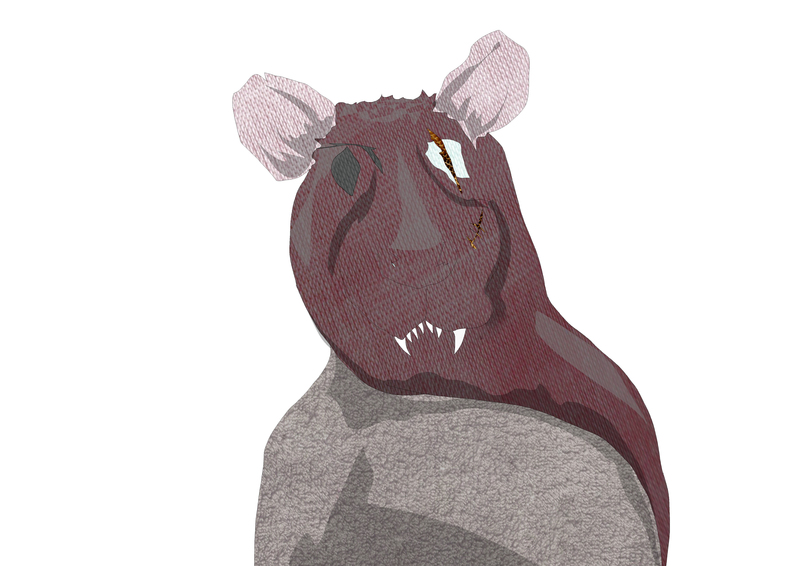 Creating images for each species, focusing on the surrounding or a specific topic e.g. how they hunt or the habitat they live in. Targeting a range of audiences but looking at people who try to do conservation work and the possible outcomes are packaging, books, website, fabric and artwork. Looking at the criteria which she has to develop, what do you want people to do e.g. do you want them just to spot them or to change their habitats? It allows people to join in instead of just giving information. It was interesting how they showed her another way of looking at it, asking questions like if you created this fabric print what does this tell the viewer about the bird or how they can help. This can relate to my work, when designing my characters or backgrounds; could they tell or educate the reader by just visual representation without telling the reader in the text. Nadeem, on his last project. Working title Mauritius as a Luxury Holiday. To convey people through pictogram in a luxurious way for business people who have money to splash and to spend it in, but then moved onto targeting the general tourists class and consider budget and expense. Looking at the rich colour palette of Louis Vitton and then using these colours to go onto his designs. He has then changed his direction again and targeting business class again by creating a fancy box to show what the experience would be using expensive materials or using the aesthetic material to attract the attention and show class. However, it is very male dominated and the images chosen are showing a British male class with the bowler hat. For research, he could go to a top business company and see who walks in and out of the area to see what type of material, clothes and items the wear and how they show their identity. It is interesting seeing another type of topic completely different to mine and see how they have to tackle issues and what type of research they can do. I could relate this to my work by looking at maybe what are children into for example the types of books or style of work or themes of books. Now this would be a wide variety of books but there might be something that stands out or is missing that I could tap into. One type of feedback for the whole group really is if there is some testing ground do it, even if you have no idea where it is going to lead you and it may be a dead it doesn’t matter. Some students spoke about dual reading, parent and child reading a book together or a teacher and child. I already knew about this and this is what I struggled with when choosing an audience as the child is the predominant audience that is why it is called a children’s book however, it may be the case the adult picks the book for them and then reads to them. If the adult finds it boring then the child will pick up on these vibes which would lead onto them not enjoying the book together. For my realisation project, I was told to focus on more why a book with educational aspects to it, can be successful or not rather than look at what techniques they used to create a character for example. 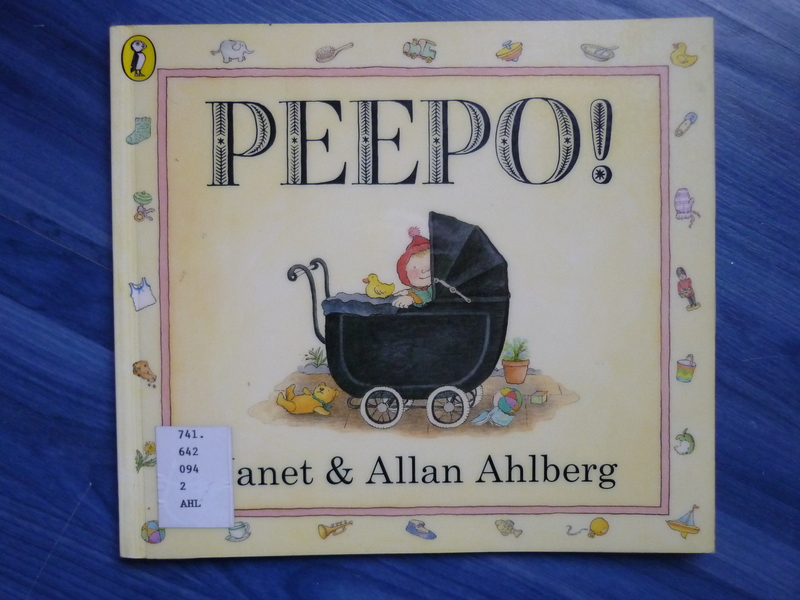 An example is Peepo!, the reader is looking through the eyes of the baby and can relate to the things they see but at the same time in the background of these scenes you are learning about the war. The BookSeller is a site that I was told to look at for sales figures and interesting articles about my topic of interest. A suggestion was made by a fellow student about what my book in the future could be based on. A book that has different stages of development which the child grows up with, how I would do this is mind-blowing and as I am focusing on a specific age if I were to do this then I would have to undertake more research on the other ages. However, I thought this was an intriguing idea and one to think about in the future. Overall, the feedback wasn’t as harsh as it could be and I can take these points and start to research into them. Benning, D., 2011, Illustrations From Wilhelm Staehle [internet]. Available from: http://the189.com/art/illustrations-from-wilhelm-staehle/, [Accessed 27 October 2014, 1.04pm]. Rough Trade Shops., 2012, Our Garden Birds – An exhibition by Matt Sewell [internet]. Available from: http://roughtradeshop.blogspot.co.uk/2012/04/our-garden-birds-exhibition-by-matt.html, [Accessed 27 October 2014, 12.37am]. This entry was posted in Presentation Time. What I would hopefully be doing in the last MA section – creating a children’s book. Throughout I will be dropping in points on how the dissertation and the concept project interlink as well as just general explanations for my actions. I hope this is what they want because this is all I’ve got, when timing it I was hitting the 8minute mark which I think is fine. I may speed up during the presentation due to nerves or when reading each slide I speak a little more about the item shown. It gives me a bit of room either side. I think I have a lot of slides as my ideas kept changing and due to it being all over the place in my head and on paper it’s hard to pin down key moments. Hopefully after I have done more research and experiments when it comes to the next presentation it will be more accurate and precise. Waaaah! I’m so nervous and I keep going through fight, flight or fright and I am currently in-between flight and fright. Hopefully tomorrow I will be in fight mode getting all my nerves out now. I am 4th on the list which is placed after a break which is good and bad as I like to be 1st or 2nd o get it out the way but I guess if there is a problem with my presentation I will have time to sort it out. I might post the presentation on tomorrow and place the comments and advice I get after I have done it. So wish me luck! This entry was posted in Day before the presentation. So for my concept project I am still analysing children’s books from a range of years (mainly contemporary) to see how their books work and how they use the book to their advantage. Recently I have looked at Peepo! 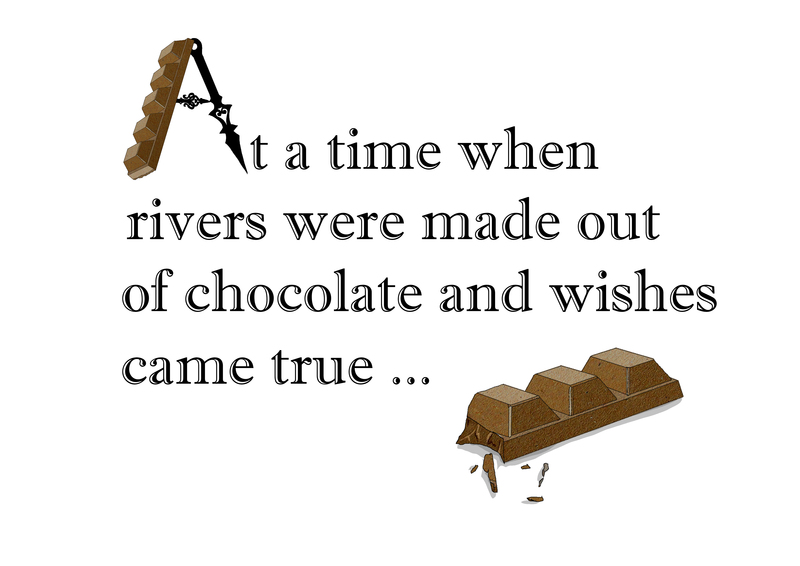 by Janet and Allan Ahlberg who have created many major books over the years. I was looking at this book as they have used the physical properties of the book to their advantage. There is a hole cut out in the centre of every second page showing what the baby can see. Showing what the baby can see from his cot. As you turn the page over the full scene is revealed, and as the page rest on the left the hole focus on the baby. It is a simple but clever design that adds anticipation in every turn of the page not knowing what is happening within that hole. With the rhythm of the text it goes a steady pace that allows you to absorb the short story and the detailed scenes. If they made the scenes with the baby full bleed, I think it would have lost it’s delicacy and simplicity. Using the white page with the thin blue line border focuses the readers attention within the ‘centre stage’. From this I decided to have a go at a similar style without copying as this would be a waste of time as I’m not making anything new. 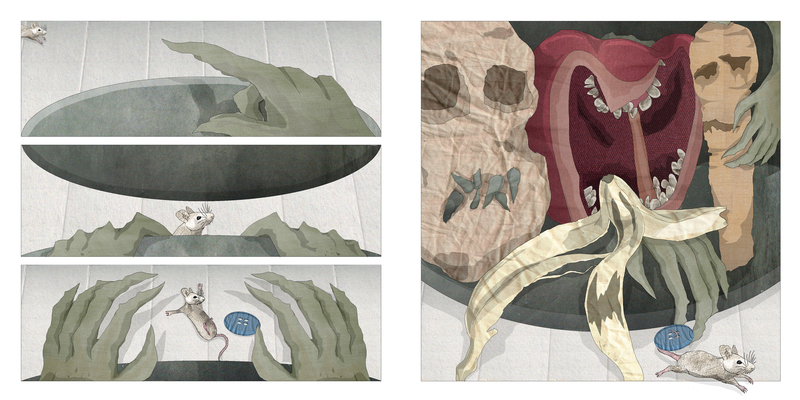 So this is a rough mock up with two double page spreads. 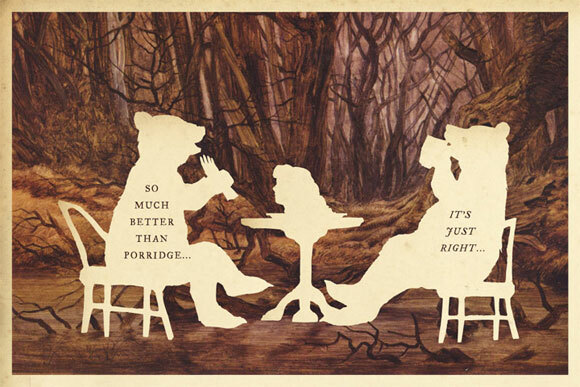 As shown there are clues on the left based on what the animal is on the next page. I placed vignettes with the text to carry on experimenting with the previous task I did and I think they look alright but I would change the display and colours as they look a little plonked on. I then used the Peepo! technique of the holes in the page, I changed them to slits with flaps to make the book more interactive. 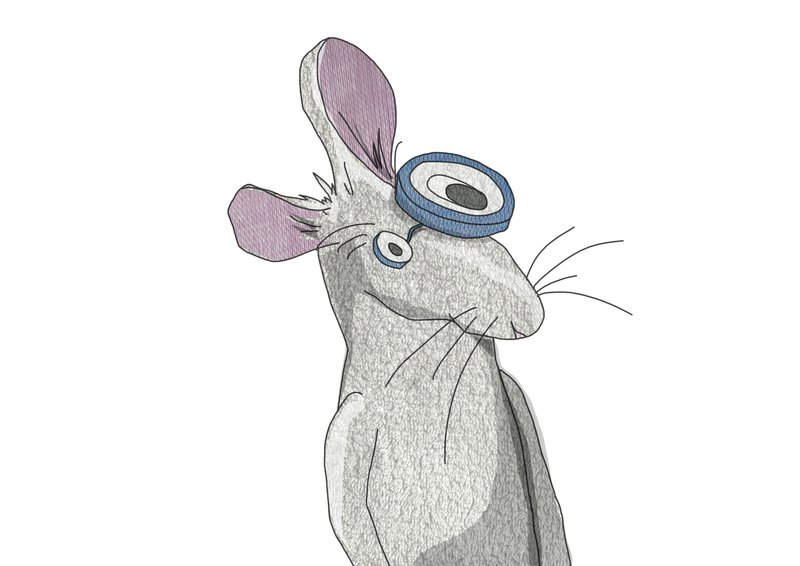 Using short sentences like ‘Go on…take a… sneaky peek…’ to entice the reader to have a look through the holes where they would see part of the animal. Small visual clues to the guessing game. A closer look at the flaps. If I would improve this I would see if I could make the slits larger or the image clearer as the are a little hard to see. As the reader interacts with the pages, it would hopefully amuse them and allow them to learn uncommon facts about the animal at the same time. Ideally they would go to their friends or older siblings and tell them what they had learned from this experience. Turn over to reveal the animal, these facts are quite bold but I just did a quick research although if I was going ahead with this idea to develop it further I would look and research into the specific animal more. 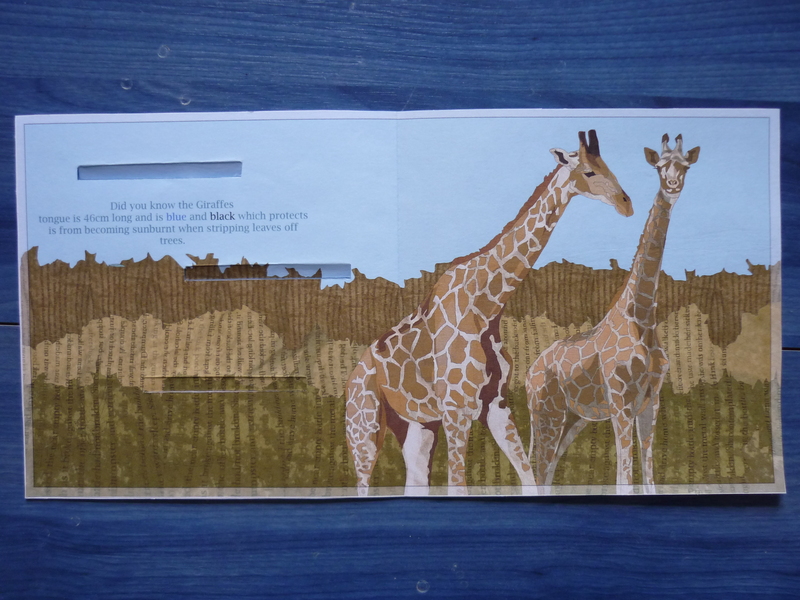 From experimenting with this design it has opened my eyes into what else can be done with the physical book as well as teaching myself facts about these animals. If I was to critique my actually work I think the colours all work well together and has a dry feeling to it. The grass in the background is paper that I took a photo from the last project with Babel. 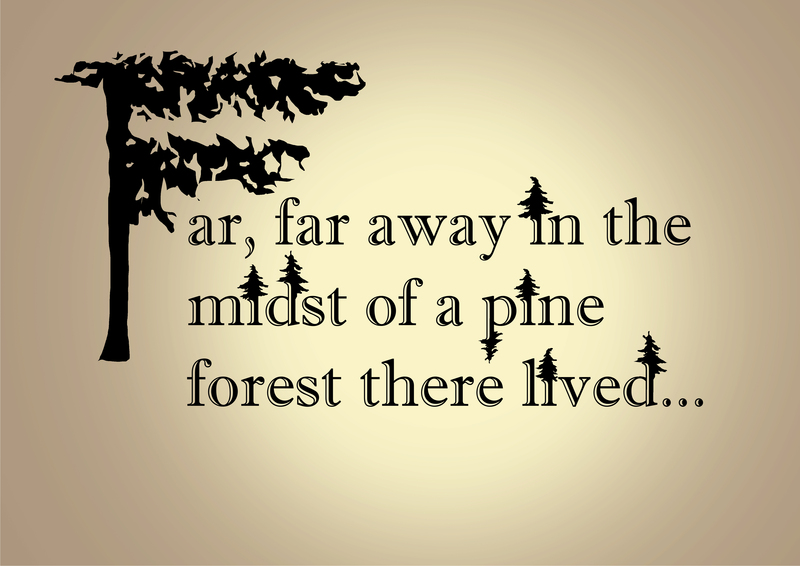 I thought the use of the words going vertical creates height and texture to the grass. However, I am not sure that the colours do merge into one another and the giraffes don’t stand out, I would have to experiment with the colours and shading. 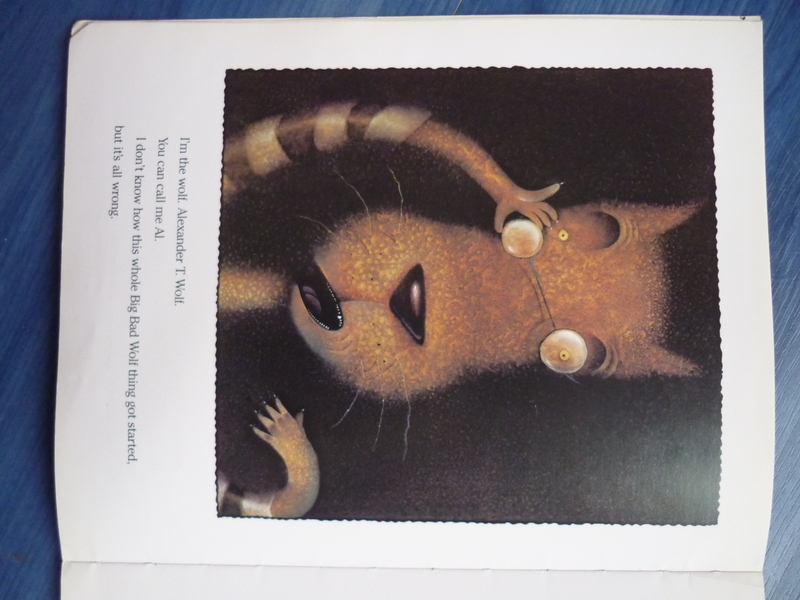 Also from reading the Picture Books as Aesthetic Objects by Lawrence R. Sipe I could use the angle of the lines and character to emphasis certain aspects of my work. What that is I don’t know until I look into it a little deeper. So from here I am going to look at another book and experiment further with my work and alternative techniques. Ahlberg, J., Ahlberg, A., 1983, Peepo!. London: Puffin. This entry was posted in Concept Project Update. Annotating and highlighting areas of interest. To test my skills I am going to try out some techniques and give myself some tasks, from this I will be able to establish what I can do and works with my style of illustration. I will then be able to apply these skills next term where I will be hopefully designing my own book.